Business ventures are started for as many reasons as the individuals who take the risk to build their own future. Whether they openly acknowledge of not, making money is the key objective. Earning a profit keeps the enterprise in business. On a microcosm level an independent operation reflects the functions of the entire small business economy. Transnational conglomerates move the physical presence of their operations as often as hot money jumps the borders to gain a higher return on equity. Merchants invest in their own neighborhoods, become the leaders of their communities and active achievers in their own business endeavors. Financial pundits echo the mind-set that most jobs are created by small business. While statistics prove this work force is the bulwark of Main Street economy, insufficient attention is given to the methods employed to establish, run and achieve profitability for Middle America. Inc. magazine published an insightful column by Leigh Buchanan, 'Lean,' 'Nimble,' and 'Innovative': Why Small Business Is (Still) the Backbone of America. "Increasingly, the public has come to appreciate small companies for the contributions they make to the U.S. economy (more than half of sales and two-thirds of new jobs, according to the Small Business Administration) and to our way of life, particularly in cities where walkable downtowns are a major draw. Many entrepreneurs prefer to stay small so they can maintain control of their businesses or because technology gives them greater reach with fewer people." For a wealth of information look to the Ewing Marion Kauffman Foundation and the Challenges Facing Main Street Entrepreneurs list. Main Street entrepreneurs historically rely on small banks to finance their companies. 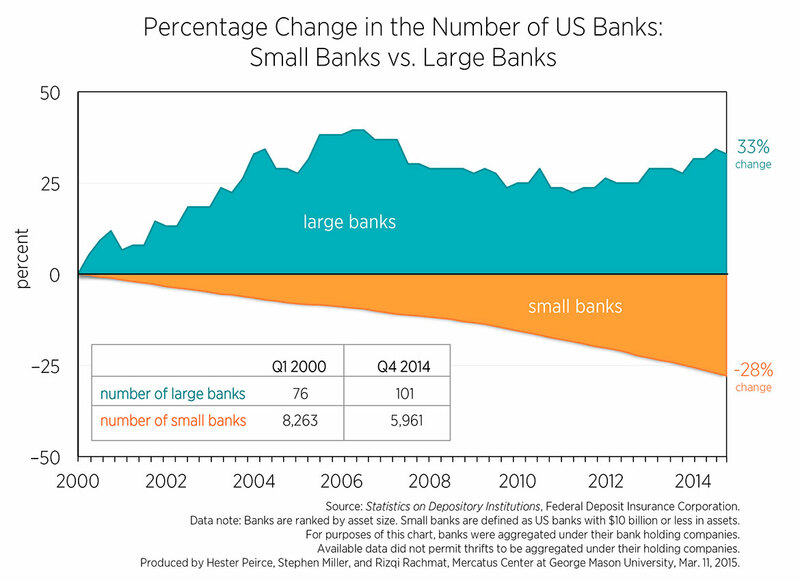 Since the Great Recession, (which disproportionately hurt Main Street businesses) lending by small banks has shrunk dramatically as a portion of the overall loan market. Simultaneously, larger banks lend even less to Main Street entrepreneurs. Marketplace lenders provide another option for Main Street entrepreneurs seeking capital, but the terms of these loans can be difficult to understand, and interest rates can be high. With traditional credit from banks harder to obtain, these alternative paths to financing will continue to be an important part of the funding landscape for entrepreneurs. Main Street entrepreneurs not only provide avenues to economic independence for individuals, but also inject competition and innovation into markets dominated by incumbent firms. But policies that limit competition, such as occupational licensing or some procurement processes, shut out Main Street entrepreneurs and entrench incumbent advantage. Main Street entrepreneurs often have to comply with the same regulations as larger businesses, but have fewer resources and feel the cost of compliance more acutely. Regulatory accumulation compounds this challenge. Local economies are direct beneficiaries when Main Street shops revitalize neighborhoods that might have seen their better days. However, banking practices have profoundly abandoned the private sector especially since the financial collapse of 2007. Overcoming this hardship is crucial for the health of the entire nation. All consumers have a stake in rectifying this liquidity starving that adversely effects the engine of commerce. The Multiplier Effect of Local Independent Businesses provides the argument for the substance that produces the real economy. Clearly communicating the importance of the local economic multiplier effect or “local premium” is a key part of effective “buy local” and public education campaigns. The multiplier results from the fact that independent locally-owned businesses recirculate a far greater percentage of revenue locally compared to absentee-owned businesses (or locally-owned franchises*). In other words, going local creates more local wealth and jobs. The multiplier is comprised of three elements — the direct, indirect, and induced impacts. Direct impact is spending done by a business in the local economy to operate the business, including inventory, utilities, equipment and pay to employees. Indirect impact happens as dollars the local business spent at other area businesses re-circulate. Induced impact refers to the additional consumer spending that happens as employees, business owners and others spend their income in the local economy. Those who shy away from creating an employee based operation, may lean towards a self-employed business as a sole-proprietorship. 50 Small Businesses You Can Start on Your Own might provide some ideas. The limits in this method is that one can only go so far without expanding and adding a labor staff. While a society may offer opportunities on the edges, a serious small business environment must be founded upon an interaction with complementary enterprises. The goal of a working economy is to grow the prosperity of a region where money changes hands. While not all needs can be satisfied within your own communities, the objective is to increase the standard of living to be able to afford the disposable income for such purchases. No doubt there is a valid place and role for corporations to fill this vacuum. Still, the basic security of a full employment economy is best achieved when small businesses are strong and profitable ventures. So how do the participants in the National Federation of Independent Business view their confidence in the current business conditions? SMALL BUSINESS OPTIMISM REACHES 16TH CONSECUTIVE MONTH OF HISTORICALLY HIGH READINGS is most encouraging. "The small business optimism index reached its 16th consecutive month in the top five percent of 45 years of survey readings, according to the NFIB Small Business Economic Trends survey, released today. The 104.7 March reading, down from 107.6 in February, remains among the highest in survey history and for the first time since 1982, taxes received the fewest number of votes as the number one problem. Taxes as the number one problem has declined since November 2017, the month before the tax bill passed, from 22 percent to 13 percent in March. Hey, just maybe the good times are here on Main Street. Current time: 04-21-2019, 06:07 AM Powered By MyBB, © 2002-2019 MyBB Group. Theme created by Justin S.